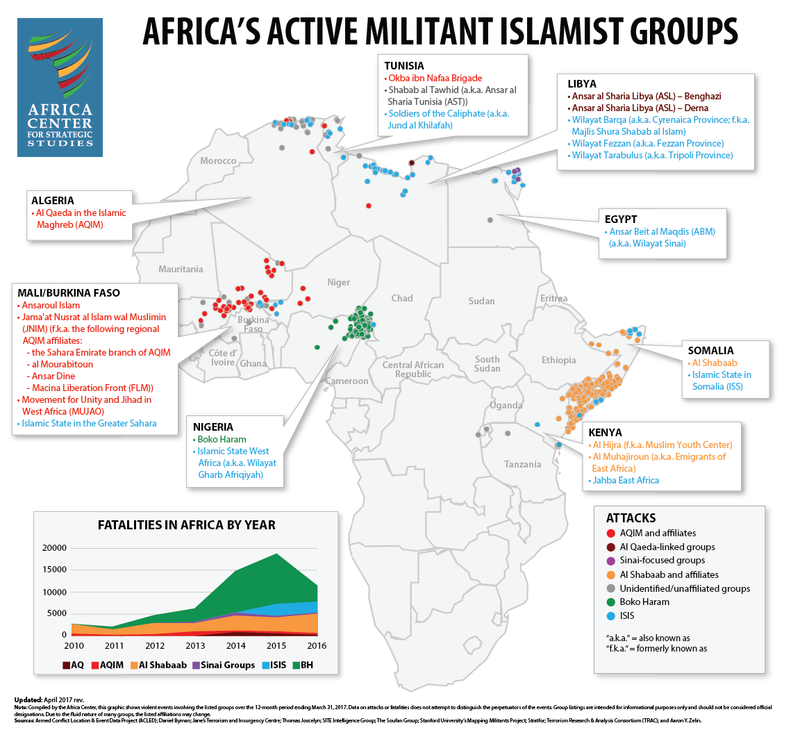 A review of militant Islamist group activity in Africa over the past year reveals considerable variation and a geographic concentration. Fatalities linked to Boko Haram dropped by 70 percent between 2015 and 2016 (from 11,519 to 3,499). This has led to a decline in the total number of fatalities related to militant Islamist groups in Africa, reversing 4 years of accelerating violence. Al Shabaab grew more lethal in 2016, with fatalities increasing by a third—from 3,046 in 2015 to 4,281 in 2016. Al Shabaab has now surpassed Boko Haram as Africa’s most deadly militant Islamist group (in terms of fatalities on all sides associated with each group). Sahelian militant groups formerly associated with al Qaeda in the Islamic Maghreb (AQIM) have demonstrated increased organizational capacity by establishing locally based affiliates in Mali and Burkina Faso. They have also created a unified front under one al Qaeda banner, Jama’at Nusrat al Islam wal Muslimin (JNIM). The Islamic State’s self-declared African provinces in Algeria, Tunisia, and Libya have made only limited progress in rooting themselves in local communities. This is the third update of a map the Africa Center for Strategic Studies initially released in April 2016. It reflects events that occurred between April 2016 and March 2017.